Vo Trong Nghia Architects is famous for large bamboo installations, but now the studio has turned its attention to social design! 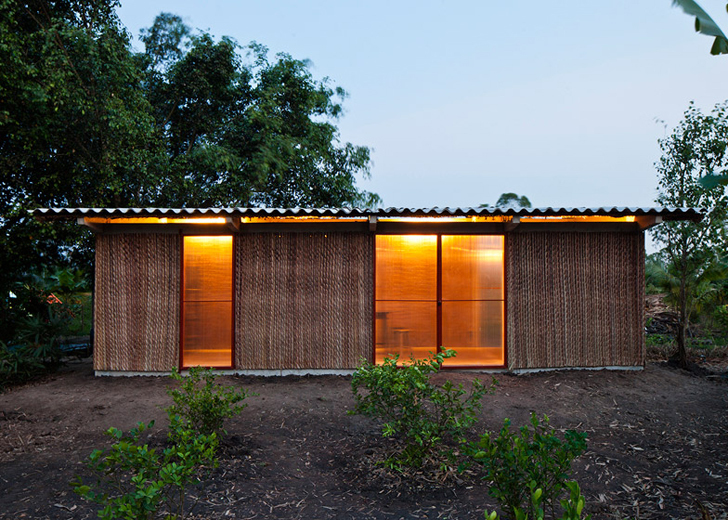 The S-House 2 is a prototype for affordable, low-maintenance and permanent housing in Vietnam. 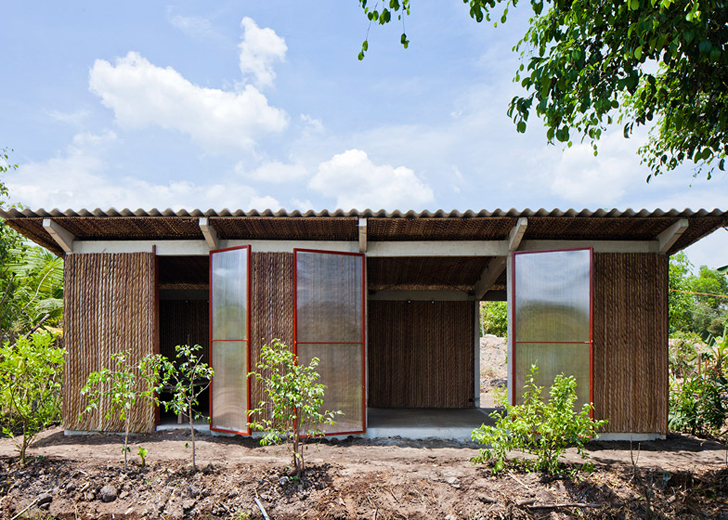 Built for less than $4000, the building offers three times as much space as most of the houses in the south-western region of Vietnam and utilizes passive design strategies to cope with harsh weather conditions. The frame, made from precast concrete, is covered with nipa palm branches and polycarbonate panels that provide doors that can be opened to bring natural light and fresh air inside. The external surfaces can be easily replaced by the residents themselves, which contributes to the building’s affordability. The roof is made up of corrugated cement and locally sourced nipa palm leaves. S-House 2 could provide people living in Mekong Delta a permanent housing solution and help address social issues. The initial design features a lightweight steel frame, which was then replaced with a more durable structure made from precast concrete. This second prototype enables fast and easy transportation of building elements by small boats, utilizing the dominant way of transportation in the region. The frame, made from precast concrete, is covered with nipa palm branches and polycarbonate panels. Doors can be opened to bring natural light and fresh air inside. The external surfaces can be easily replaced by the residents themselves, which contributes to the building’s affordability. The roof is made up of corrugated cement and locally sourced nipa palm leaves. S-House 2 could provide people living in Mekong Delta a permanent housing solution and help address social issues. The initial design features a lightweight steel frame, which was then replaced with a more durable structure made from precast concrete.